Allylamine is a liquid and stable organic compound. It is the simplest unsaturated Amine. The International Union of Pure and Applied Chemistry (IUPAC) named this compound as 3-Amino-prop-1-ene. Allyl Chloride is treated with Ammonia in order to produce this substance. This treatment is followed by the process of distillation. Pure samples are synthesized by the Hydrolysis of Allyl Isothiocyanate. The behavior of this chemical is typical to Amines. The chemical formula for this organic compound is C3H7N. Following are some of the basic properties of this substance. Appearance: It is a colorless liquid. Odor: This compound has a sharp odor that resembles Ammonia. Solubility: Allylamine has high solubility in water. Molar Mass: The molar mass of this substance is 57.09 g/mol. Specific Gravity: It has the specific gravity of 0.761. Melting Point: The melting point of this compound is -88 °C (-126 °F). Boiling Point: Boiling point of Allylamine is somewhere between 55-58 °C (131-136 °F). Density: The density of this liquid substance is 0.7630 g/cm3. Vapor Pressure: Its vapor pressure is 32.3 kPa at 25 °C temperature. The formula of this compound can also be denoted as CH2=CHCH2NH2. There are three Carbon atoms in one molecule of this Amine. Carbon atoms have four valence electrons so it can create four covalent bonds. Two of the three Carbons create a double bond (a bond involving four bonding electrons) between themselves. Five of the total seven Hydrogen atoms create single bonds with Carbons. Nitrogen has three valence electrons and creates a single bond with the last remaining valence of Carbon. The two remaining Hydrogen atoms create bonds with the two other valence electrons of Nitrogen. Homopolymers and Co-polymers can be prepared by Polymerization of Allylamine. The resultant Polymers are very useful for reverse osmosis. “Poly (Allylamine Hydrochloride)” is the name of one of the most useful polymers. It has numerous applications in biomedical field. 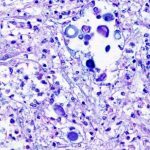 However, the most important use of Poly (Allylamine Hydrochloride) is in Cell Encapsulation. Isomerization of this organic compound is done in the presence of Rhodium as a catalyst to produce Aldimine. 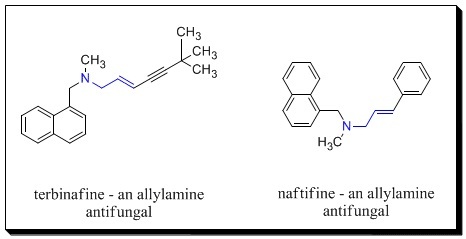 This simplest and stable Amine has various uses. It is used as a chemical solvent in different industries. Allylamine is used as antifungal medicine for the treatment of skin and scull ringworm. Cream or pills made from this compound are used for this purpose. The creams do not have any side effects; however, the pills may cause headaches and stomach problems. It is also used as a medicine for the skin disease “Athlete’s Foot”. This Amine is used to make antibiotic, diuretic and sedative medicines. It can cause adverse effects on human health in case it comes in direct contact. One should take certain safety measures while handling this organic compound. It can cause severe eye and skin irritation if comes to direct contact. Accidental inhalation or ingestion can also be harmful. Over exposure to Allylamine may even cause death of the victim. It might have toxic effects on different organs including heart, liver, kidney and central nervous system. Eye Contact: In case of direct eye contact, contact lenses should be removed immediately. The victim should flush the eyes with cold water for 15 minutes. Medical attention is required. Skin Contact: The victim should wash the affected area with soap and plenty of water and apply an antibacterial cream. The contaminated shoes and clothes should be removed and washed properly before re-use. Immediate medical attention is needed. Inhalation: The victim should be removed to a well ventilated area. Oxygen or artificial respiration should be provided if the victim is experiencing breathing difficulty. Performing mouth-to-mouth resuscitation can be hazardous for the person providing the aid. One should obtain immediate medical attention. Ingestion: Vomiting should not be induced without medical instruction in case of accidental ingestion of this material. It is never advisable to give anything by mouth if the victim is unconscious. Tight clothing like tie and belts should be removed. It is important to get immediate medical assistance. Gloves, splash goggles, lab coats, boots and vapor respirators should be used for proper personal protection. This organic chemical compound should be stored in tightly closed containers in a cool and well ventilated area. It is a highly inflammable substance. Water spray, alcohol foam or fog can be used to extinguish a large fire caused by this chemical. The firefighters should use proper firefighting gear. The spilled liquid should be diluted using water and mopped up quickly. In case of large spillage, it should be kept out of reach of heat or any source of ignition as it is a flammable chemical. The spilled liquid should be absorbed with dry sand or soil. The disposal of waste material should be done according to the local, state and federal regulations of environmental control. 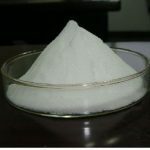 Allylamine is a useful organic compound and its properties are utilized in industrial as well as medicinal fields. It is one of the most useful chemical solvents used in various industries.